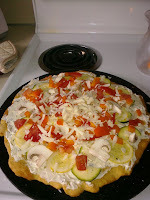 Tina Marie Hilton, the sole proprietor of Clerical Advantage Virtual Assistance Services, posted this picture of Cold Veggie Pizza on her Facebook page. It looked so delicious that I asked her to share it with you. While you may think you've seen this recipe before, Tina's is quite different from the usual appetizer recipe in that there is no Italian Dressing mix and it's not cut in those nice, neat little squares. Tina's Pizza is very rustic in appearance. The way she forms it results in it looking like more of a meal. Press crescent roll dough into the shape of a pizza dough and bake according to directions. Let baked dough cool completely. While the baked dough is cooling, bring cream cheese to room temperature and slice veggies. When dough is completely cool, ‘frost’ with cream cheese and top with veggies. Makes 12 to 16 servings depending upon size of slices. Tina adds: I'm not sure where this recipe came from but think my daughter got it at a party. It's easy and a great way to get your vegetables. I use low fat crescent roll dough and low fat cream cheese to make it an even healthier dish. I'll be making this soon because I know The Don will like Tina's Pizza a lot...what's not to like when you have a bread and cream cheese combo, even if that is low fat? It would be a great weeknight meal...add a glass of nice red wine and you're good to go! By the way, Tina participated in both the Virtual Paralegal Interview Series and the Sixty-Six Solid Tips from Your Virtual Paralegal Success Team. You'll want to subscribe to her great blog, follow her on Twitter (@TMarieHilton) and also check out her Girly Girl Geek program. She's a wealth of knowledge. Ethics Tip: Please Sign My Name...NOT!